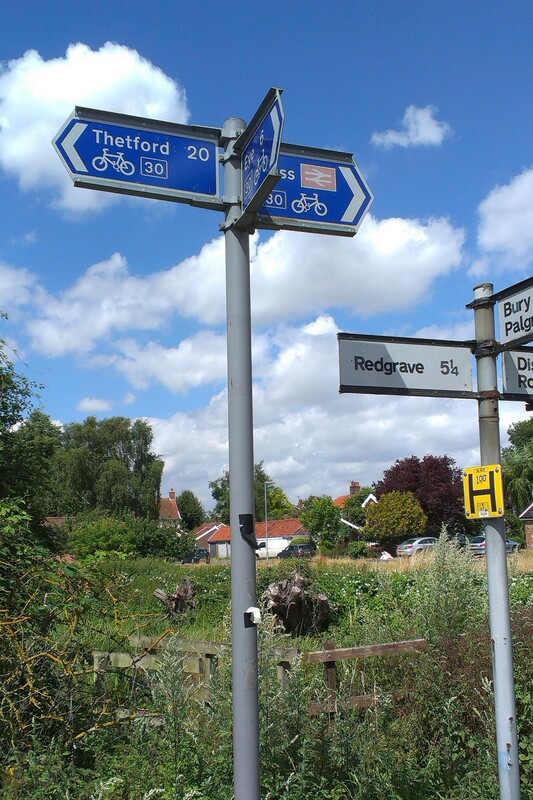 Sustrans sign-post, just south of Diss. Norfolk’s Regional Route 30 helps form a complete loop of National Cycle Network around the county. Starting from Ten Mile Bank, it runs eastwards through Thetford to the coast at Lowestoft. If then follows the coast north and then west via Great Yarmouth and Cromer to meet Route 1 north of Great Walsingham. Route 1 and Route 11 then complete the loop via King’s Lynn. Within the Breckland and Waveney Valley group area, Regional Route 30 runs from its junction with Route 11 at Ten Mile Bank, though Feltwell, Brandon, to Thetford. The route continues east through Bridgham, Thelnetham and Diss to Harleston.